ALEC, the American Legislative Exchange Council, and ALEC members are on the run in Arizona. As more Arizonans learn about the tactics and operating procedures of the obscure network, the organization and its corporate funders are scrambling to come up with ways to justify their unjustifiable agenda. ALEC had operated in relative obscurity for decades since its inception in 1973. However in the past year, with the launching of the ALEC-Exposed project, and some diligent investigative reporting from journalists and good government organizations alike, the veil has been removed, and ALEC has been on the run since – in recent months, thirteen companies have withdrawn financial support from the organization and 28 state legislators have renounced their membership. The ALEC agenda is out of the shadows, and its affiliates have been scrambling to come up with talking points to sugarcoat their policies. Unfortunately, no amount of obfuscation can conceal the truth. The ALEC agenda is harmful to everyday citizens because it rewards the corporations who fund the network – nearly 98 percent of it. When ALEC legislators and ALEC corporate lobbyists like Russell Smoldon agree to meet behind closed-doors like they did yesterday morning, their attempts to assuage their image crisis only tarnish their reputations further, for what could they could they possibly be discussing that requires confidentiality? Click here to view PFAW Foundation’s press release on this development. Endnote: In November of 2011 and April of 2012, PFAW Foundation released two reports, in conjunction with Common Cause, Progress Now and the Center for Media and Democracy, documenting the enormous influence that ALEC has in Arizona. The reports evidence how ALEC legislators have introduced and passed ALEC model legislation that has damaged communities and harmed the state – from attacks on public education to privatizing prisons to reducing consumer protections, the corporate-backed ALEC agenda has transformed Arizona into an ALEC model state, one that Arizonans, as evidenced by the recall of ALEC member and former Senate President Russell Pearce, are rejecting in force. Following the release of the second report, Arizona Public Service Company (APS), Arizona’s largest utility in the state, announced it was severing ties with ALEC. 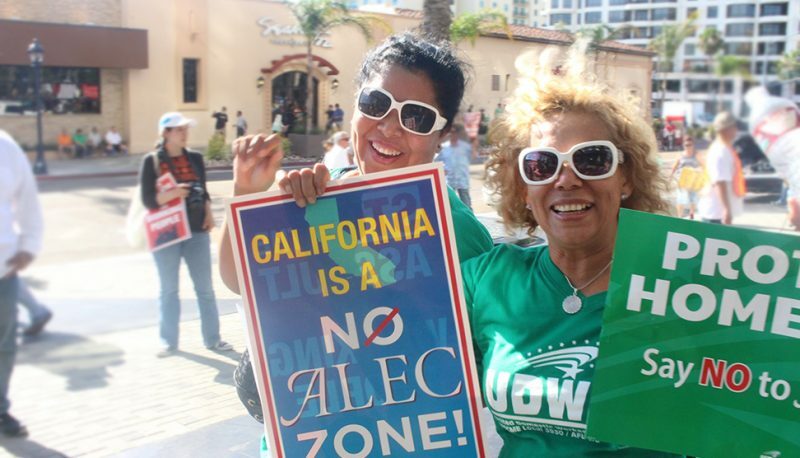 And for more information on State Representative Debbie Lesko – who was one of the hosts of the ALEC PR strategy meeting – and her ties with ALEC-sponsor SRP, please check out CMD’s post on the connection.